Waterproof, breathable fitted sheets that can be kept a secret? Impossible you say? Nope they exist! No more plastic sheet, or noise when you lie down. 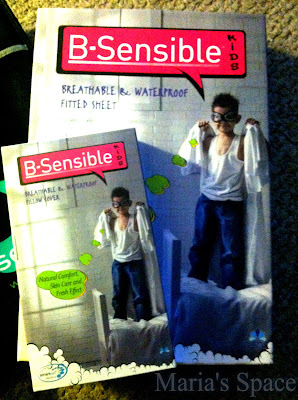 These sheets by B-Sensible Kids are available in Crib size, Twin and Full and come in a variety of colors. They also have B-Sensible in Queen and King so no one ever has to be embarrassed again! AND..as we get older accidents can happen. Why be embarrassed, throw your sheets away or worry about your mattress after too many accidents when you can get yourself the most perfect fitted sheet for you! I have problems with sheets staying on my mattresses because we have pillow, memory foam mattresses which means they are very very thick. This sheets wraps entirely around the mattress and never come off the corners. Probably one of the best things about them in my eyes. Here we are showing them off in Goddess' room. She ordered Lavender but you can see they are pretty blue. We love them and they are a nice quality too! I think this is important to mention because as someone who doesn't have bedwetting problems I would still buy these. The quality is amazing. They are soft, easy to wash and fold and don't get all wrinkly. Purchase 2 or more BSensible® 2 in 1 Waterproof Fitted Sheets for Baby or Kids from Amazon.com and receive 22% OFF a Queen or King size fitted sheet when you enter Promo Code: KUBOSHDM at checkout. Offer ends June 30th, 2015. Disclaimer: We received a complimentary product for our honest opinion. No monetary compensation was offered or received.